I have a whole collection of photos with Santa over the years. I’m crying in some of them. Smiling in most of them. These were happy memories for me as a kid. When I had kids of my own, however, I never adopted the tradition of having our photo with Santa. Why not!?!? I ask myself this over and over again every year. It’s not too late. Sure they’re getting a bit too old to sit on Santa’s lap, but it still could be a fun memory. Besides… We could do a family photo. We could start a new tradition now. This year. 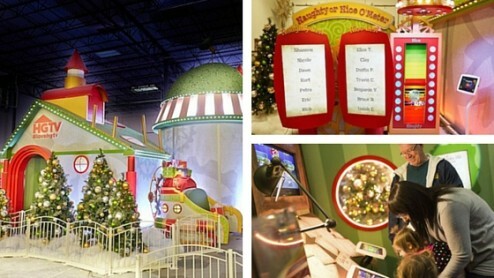 Macerich Malls all over the country have been transformed, thanks to HGTV, to spread holiday cheer! Now through Christmas Eve, Dec. 24, Santa HQ is spreading holiday cheer to guests of all ages with a 21st century immersive journey that features state-of-the-art digital technology. In addition to the classic photo with Santa Claus, mall guests can take an Elfie selfie to star in their own holiday video, use Elf-Ray Vision to explore Santa’s Observatory, and test out the Naughty or Nice O’Meter. If that doesn’t sound like good, clean, holiday fun… I don’t know what does. Reservations to visit the experience can be made in advance at santa-hq.com/reservations.